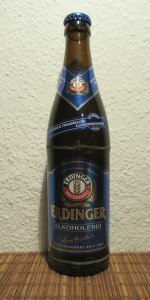 330 ml bottle into lager glass, best before 2/2017. Pours crystal clear medium golden/amber color with a 1 finger dense and rocky off white head with fantastic retention, that reduces to a nice cap that lasts. Nice dense soapy lacing clings on the glass, with a moderate amount of streaming carbonation retaining the cap. Fantastic appearance. Aromas of wheat, cracker, white bread dough, and biscuit; with lighter notes of honey, toast, banana, bubblegum, clove, peppercorn, herbal, floral, grass, and yeast earthiness. Nice and pleasant aromas with good balance of pale/wheat malts; light-moderate fruity/spicy yeast, and earthy hop notes; with solid strength. Taste of wheat, cracker, white bread dough, and biscuit; with lighter notes of honey, toast, banana, bubblegum, clove, peppercorn, herbal, floral, grass, and yeast earthiness. Slight NA cardboard notes in aromas/flavors, but not overwhelming. Light-moderate herbal, floral, grassy bitterness; and peppery/clove yeast spiciness on the finish. Lingering notes of wheat, cracker, white bread dough, and biscuit, honey, toast, banana, bubblegum, clove, peppercorn, herbal, floral, grass, and yeast earthiness on the finish for a good bit. Very nice robustness and balance of pale/wheat malts; light-moderate fruity/spicy yeast, and earthy hop flavors; with a nice malt/bitter/spiciness balance; and no cloying/astringent flavors after the finish. Fairly crisp/clean finishing. Light-moderate increasing dryness from lingering bitter/spiciness and carbonation. Medium-high carbonation and medium body; with a very smooth, moderately creamy/bready/grainy, and fairly sticky mouthfeel that is nice. Overall this is a delicious NA wheat beer. All around nice robustness and balance of pale/wheat malts; light-moderate fruity/spicy yeast, and earthy hop flavors; very smooth, and fairly crisp/clean/refreshing to drink with the mellowly bitter/spicy/drying finish. I was expecting a lager base style like the rest of the NA beers I've had, but this leans more into a hefeweizen area; but is not strong on the yeast character as would be expected. Great clean wheat/pils malt showcase; with solid fruity/spicy yeast presence, and earthy noble hop balance. A very enjoyable offering, and impressive NA brew. Really good for an NA beer. Tastes better than a lot of alcohol beers. Clear pale gold with three fingers of dense white head. Rings of lace. Smell is malt and hint of yeast. Slight floral grassy hop note. Taste is bread crust malt grassy hops and yeast. Mouthfeel is medium with strong carbonation. The finish is lightly dry and balanced. Overall one of the very best of this style. I enjoyed it. Best before date 03-2019. From a 500ml bottle, poured into a tall glass. Appearance: a deep foamy head with good retention that leaves some lacing. The 'beer' itself a cloudy, translucent medium amber. Little carbonation. Smell on opening the bottle distinctly and pleasingly beer-like. In the glass, the beer character of the aroma faded quickly, leaving a faint citrus note. Taste is not pronounced, in line with the aroma, though interestingly hop bitterness was present in the foam. Mouthfeel was thin, approaching watery. I found this a creditable attempt at a drinkable non-alcoholic beer. To call it bland or inoffensive is not actually a criticism in this style. I can't imagine drinking more than a couple of these, but for the purpose it is very acceptable. As far as low/no alcohol beers go, this is one of the best i’ve come across so far. Only Brewdog’s ‘Nanny State’ beats it. It’s nothing like a wheat beer, it has a metallic aftertaste and the body is predictably thin. However, it looks the real deal, it smells and tastes malty, it’s highly carbonated and it’s refreshing enough when drunk ice cold. For a nonalcoh beer it's pretty good. As close to a hefeweisen without any alcohol. Nice fluffy head and subtle banana flavor. Great summer beer for those who can't consume alcohol. Aroma is promising but has a slightly sweet candy/floral flavour: violets, lavender and vanilla with a skunky background. Pours orange and pretty clear. White head dissipates steadily leaving some residual head and lacing. Smell is remarkably skunky for a weissebier. Hint of a metallic note with faint hints of floral hops. Taste has notes of wheat, sweet floral hops, strong grain notes, and an overly sweet bread note on the finish. Feel is decent for the style. Reasonably light although the wheat provides some heft. Mild carbonation. Overall I suspect this bottle was on the old side. Id like to revisit a fresh one. For what it is, its ok, but its not something I'd likely care to ever drink again.